Semi Precious Stones Meanings: the traditional classification in the West, which goes back to the ancient Greeks, begins with a distinction between precious and semi precious; similar distinctions are made in other cultures. In modern the blue Semi Precious Stones use the precious stones are diamond, ruby, sapphire and emerald, with all other gemstones being semi precious. Semi Precious Stone blue is rare in stone. What is Blue sodalite meaning? Sodalite is not typical gemstone. It is not even classified as a rock. Sodalite is actually a beautiful, deep blue mineral that is carved into statues, pyramids and obelisks. Even though it lacks the hardness of rock gemstones, sodalite is also used to make lovely jewelry. Just don't try to cut glass with your sodalite ring. There are other uses for sodalite mineral stones, too, all of which are based in sodalite meaning. As a stone of truth, sodalite mineral stones improve communications. Disagreements and arguments are easier to work through with the use of sodalite. This is an important sodalite power that is at the root of sodalite meaning. 1. quarry blocks(big or small block,max weight of the big block can be 22 tons). 2. slabs(translucent or no translucent),big slab from whole block or big laminated slab from with small blocks-small pieces of tiles laminated with other material. Suitable for wall tiles, floor tiles, steps..
3. table tops and countertops. HR Stone company invest blue semi precious tiles quarry in Africa, The sodalite rock in Africa that also contains abundant blue sodalite and white nepheline. Both of these minerals have a hardness of approximately 6 on the Mohs hardness scale. Our quarry start to yield two kinds of blue sodalite production--big size blocks and small size blocks in 2018. Max size of big block can be about 250*180cm and weight about 15-20 ton per block. Small block has two sizes: 3-10cm 10-30cm.Annual yield of blocks is about 100containers. Sodalite Vs Lapis :Blue sodalite has a strong resemblance to Lapis. For metaphysical purposes, this stone is said to improve one's Logical thinking. 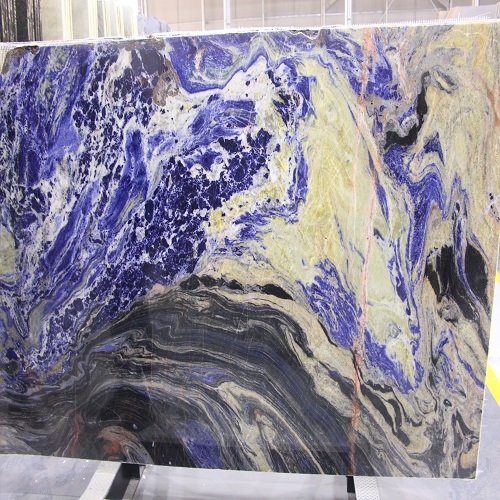 Sodalite was originally discovered in Greenland in the early 1800's, then about 100 years later it was next found in Ontario. A few other sources, mostly in Africa, exist today. Looking for ideal Semi Precious Stone Blue Manufacturer & supplier ? We have a wide selection at great prices to help you get creative. All the Semi Precious Stones Meanings are quality guaranteed. We are China Origin Factory of Blue Semi Precious Stones. If you have any question, please feel free to contact us.